Imagine, you’ve just realized that your business partner has been cheating you for a long time, and because of him, you’ve lost tons of money. You need some tools to handle the situation, right? Tools like a gag, a gun with a silencer, a proper shovel, etc. Same goes for making money – in order to make money you need some great tools, right? Below you’ll find the list of tools you need to succeed at any level! Every website or a landing page should be hosted somewhere, right? A2 HOSTING is the fastest web hosting provider I’ve ever used. I’m personally using it for my websites, and I highly recommend using A2 HOSTING for your projects. I like its super fast SSD servers that loads web pages much faster compared to standard hosting. It is important to note that A2 HOSTING is often recommended by and for bloggers, webmasters, online marketers. Here is a 51% OFF DISCOUNT LINK especially for you! Money is in the list. Your e-mail list is your most valuable asset! ConvertKit makes it easy to collect the names and email addresses of people who visit your website or your landing pages. It offers a bunch of landing pages as well. ConvertKit organizes your subscribers in a fundamentally different way than Aweber (using tags). Remember! Most people need exposure to you at least 7 times before they buy from you, so if you don’t capture their information, you will lose customers forever. What’s really great is that migrating an email list from Aweber to ConvertKit makes no difficulties. 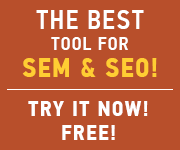 Semrush is all-in-one marketing toolkit for digital marketing professionals. It really is a powerful and versatile competitive intelligence suite for online marketing, from SEO and PPC to social media and video advertising research. OnlyWire is a great tool that auto-submits your content to Social media networks such as Facebook, Twitter, Google+ and LinkedIn with speed and simplicity. Not only do you increase your website’s traffic, but also you save time and money. Try OnlyWire For Free NOW! From time to time I buy solo ads from Udimi. A Solo Ad is a form of advertisement that is sent out to an entire or portion of an email subscriber list. I believe that Solo Ads are an effective method of email advertising, and Udimi is a great and widely known service among online marketers. If you run a YouTube channel, TubeBuddy is a must have extension! Try TubeBuddy for free NOW! If you’re just starting out and don’t know where to go, I highly recommend that you join Affilorama. Affilorama is an incredible mastermind group that I am a member of. It is a training centre and online community for aspiring affiliate marketers. They offer over 85 FREE video tutorials. With full responsibility I can recommend joining Affilorama for leaning affiliate marketing. Try Affilorama For Free NOW!